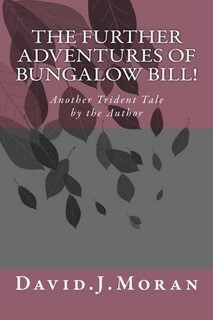 The Further Adventures of Bungalow Bill, has a request by the readers to inform the author of your possible vote as a member of the the Jury, Quilty or Not Quilty, if the former, then what should the sentence be? This has been open to readers as soon as the book was published by Amazon (ISBN 9781539668947) also at the same time Kindle downloads both of which are available in seven different languages. Already some of the readers have suggested points of reforming our Phil, with the introduction of shearing scissors to body parts, hanging him (not legal cannot use it) accidentally dropping him down an old coal mine, have a bomb fire with him as the guy, and so on, once I have collected ideas of about a hundred readers the next maybe final book, I will use the most popular suggestions, if legal of course, well perhaps not legal in the true sense? I must add, that one tends to forget localisms that are used solely in Great Britain, may be a mystery to readers in other Countries, so I will try and explain the term! Male person is normally is a”Billy”, but this not exclude the female personification you all know him, or her met him or her, worked with him or her. lived next door to him or her, he is the man or woman, who can get you something cheap that had just fallen off a lorry, one of his, her ‘friends’ did not want it, (He, she nicked, pinched or stolen it) He or her will borrow anything from you, money, garden tools, tools of any nature, food, or anything you are daft enough to lend him, but denies all knowledge when you ask for it back, or even refuses ever to speak to you again because he felt you had insulted him or her! Look around your company of friends have you met him or her yet, do not worry you will, they are parasites, if he, or she has not got something you have saved up for and bought with hard earned money, that is all the justification he or her needs to steal it! So welcome to this my second book, I would suggest you read the first one, as the plot gets thicker as my Billy achieves notoriety as a home owner, business man, and for the first time in his life in credit, as well as a killer! I hope you enjoy my books, you can contact me on www.davidjmoran.co.uk, or davidjm0125@icloud.com, which ever you prefer, but please read the web page, it is the reason I love writing books!